Melanie and Joe are talking about the wedding. Joe reckons it was the most boring buck's night in history(!) Toby tells them that he likes a girl called Candy now. MELANIE: Toby! That's not very nice. JOE: Er...yes apparently she's well-developed for her age. Melanie suggests taking a camera to the wedding. Toby wants to know if Harold will be coming to the wedding and Joe is forced to admit that Harold has had a heart attack. Toby is very upset and is fed up of being treated like a little kid. Madge has finished the wedding cake and Helen is very chuffed with it. 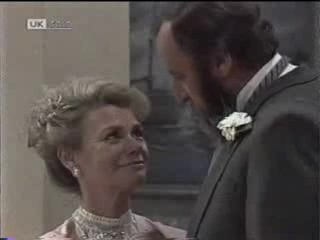 They chat about Harold and then Madge tells Helen that she has a surprise wedding present for her - but not until tonight. Joe apologises to Toby for not telling him the full story about Harold. He was just trying to protect Toby after the deaths of his mum and Kerry. He promises never to keep things from Toby again. Toby has an idea to help Harold to be present at the wedding. As Helen approaches the door, Jim, Glen, Todd, Lucy and Josh line up to apologise for the argument last night. They all produce little bunches of flowers! Helen is pleased and forgives them all. They run off to get ready for the wedding. Harold is fed up of Madge fussing over him. He's in a bad mood because the food is awful and they haven't got a vegetarian option. 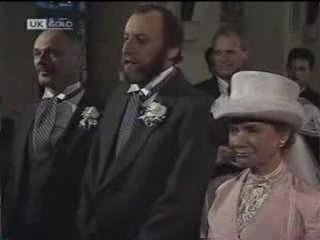 Madge tells Harold that she's resigned from the choir and the fundraising committee on his behalf and he isn't pleased! Joe and Toby come in and tell Harold that they've had an idea. Michael's best man Charles has turned up all the way from Perth. CHARLES: Not at all. It's a pleasure. After all you've been through, I'm glad to see you're finally happy. Lucy and Christina are discussing the Lassiter's girl promotion and Lucy is determined not to let Jim ruin it for her. Jim comes in and gives Helen a present - a lovely brooch. Helen is chuffed. JIM: I wanted to give you something special for helping me with the kids all those years. HELEN: It's been a pleasure, you know that. JIM: It was service well beyond the call of duty, and I want you to know I appreciate it. This place isn't going to be the same without you. We'll miss you. See you at the church. Michael, Charles and Jim have arrived in a vintage car. The vicar admires the car. Michael is very nervous and Charles encourages him, saying everything will be fine. Glen, Lucy, Todd and Josh arrive in a yellow vintage car and finally Helen and Paul arrive in a third, white car. Jim helps her out of the car. Paul is leading Helen into the church. MADGE: I knew Helen would look great in that style. DOROTHY: Yes, I'm glad she took my advice. 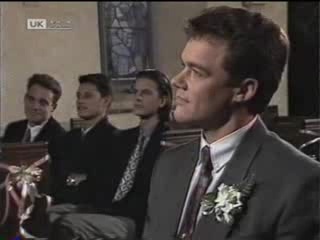 The wedding march begins and Paul escorts Helen up the aisle to where Michael is waiting at the front. Joe calls Toby up on a mobile radio - he's piping the ceremony over the airwaves to Harold and giving commentary! JOE: I'll now hand you over to Mel for a description of fashions in the field! But the radio cuts out. VICAR: Therefore if anyone can show any just cause or reason why these two may not be joined, then speak now, or hereafter remain silent. Just then, the radio springs back to life in the silent church. HAROLD:(over the radio) There is something wrong with this equipment! Everyone looks round and poor Joe is horrified. VICAR: Er...was that a statement of just cause? JOE: Er...no, no, your holy reverend! HELEN: I Helen, take you Michael, to be my husband according to God's holy ordinance. To have and to hold from this day forward. For richer, for poorer, in sickness and in health. To love and cherish until we are parted by death. 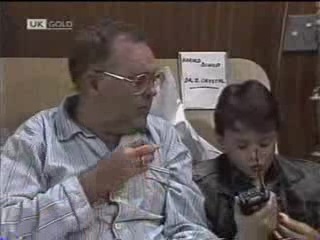 There are the traditional shots of members of the congregation, including Harold in his hospital bed, eating chips! HELEN: And to this I pledge you my word. 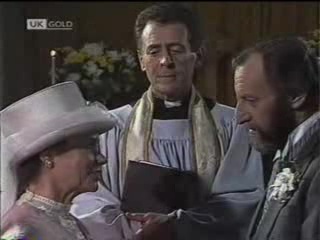 The vicar pronounces Helen and Michael husband and wife. Helen and Michael kiss while the congregation claps. The wedding reception is set up with tables in the living room and the Robinsons. Charles is reading out telegrams. One is from Charlene and Scott. CHARLES: And now from Scott and Charlene in Brisbane. Congratulations Gran! Looking forward to meeting your new addition to the family. Surprise, surprise, in seven and a half months time, we'll be making our own new additions to the family! HELEN:(in shock) Charlene's having a baby?! Madge, why didn't you tell me! Later, Paul tells Christina that he's been reading about pre-natal learning - it's a way of stimulating the baby while still in the womb. Christina thinks this sounds very weird. Still later, Michael and Helen cut the cake while the Neighbours look on happily. They all clap while Helen and Michael have a snog (slight yuk!). 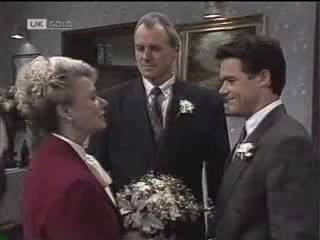 Then Michael makes a speech and promises to make Helen "as happy as she deserves to be". Dorothy is visiting Harold who is apparently he's being discharged tomorrow. Outside, Madge tells Dorothy that Harold isn't being discharged at all - Harold's signing himself out against advice. Madge is worried, as well as worried about Harold eating junk food. It's like Harold doesn't care anymore. Helen is pleased that Jim and Paul have got along with each other today. 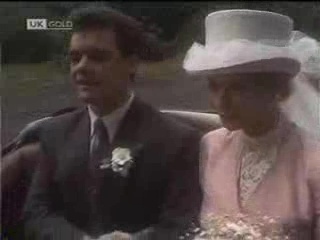 Then she and Michael leave to go on their honeymoon. Helen throws the bouquet and Melanie catches it, much to her delight! When Helen is gone, Paul shuns Jim and leaves out of the back door. In the kitchen, Melanie sees that the bride and groom figurine as fallen off the cake and smashed on the floor.